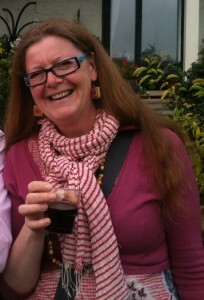 The artist and creative development worker for the Soul MarksTrust is Carol Marples. CAROL MARPLES has been involved in creating visuals for worship, and in running workshops in art and prayer throughout Scotland for over 20 years. She graduated from Edinburgh College of Art in 1988 with a BA (Hons.) in Tapestry. Since then she has regularly exhibited her own work, taught, and led workshops for all ages and abilities in textiles, drawing and painting in Scotland, Europe and North America. Carol has worked as an artist with L’Arche (both locally and internationally) and with St. James Episcopal Church, Leith. She has taught in community education and at Leith School of Art. In 2000 she completed the Spiritual Direction course at the House of Prayer, Nile Grove, Edinburgh. In 2014 Carol took up the part-time post of leader of the Art and Spirituality course at Leith School of Art. Carol also continues to collaborate as a liturgist and artist on worship services, and leads the occasional workshop. Since SOUL MARKS was established in 2003 Carol’s ministry has taken her to many places. The work has included creating large-scale artworks with local and international communities, and leading a variety of workshops, projects and worship in conference centres, church halls, barns, cathedrals and tents in many other unexpected places. It is this past and present work and experience that makes up the wholeness of the work that is Soul Marks.